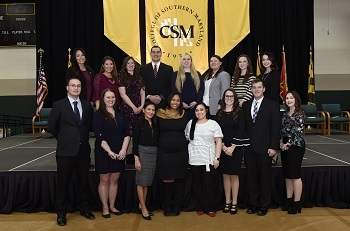 During the College of Southern Maryland’s (CSM) nursing recognition ceremony January 17, as part of the college’s 20th Winter Commencement, 38 associate degree nursing candidates received their nursing pins. 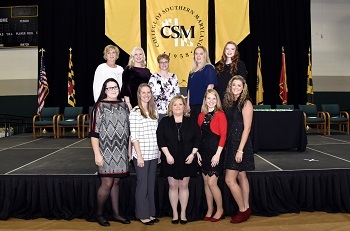 Rachel Turner, 21, of Waldorf, was awarded the CSM Health Sciences Division Achievement in Nursing Award, presented to the graduate who demonstrates academic achievement, clinical competence, community service and leadership potential. The day was especially sweet for Turner, who learned two days before ceremony that she would begin her career as a registered nurse at Washington Hospital Center’s in the stroke unit Feb. 25. 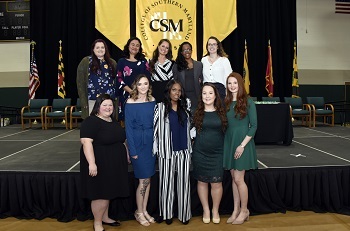 Marilaan van der Merwe, 25, of Leonardtown, was awarded the CSM Health Sciences Division Academic Achievement, given to the graduate with the highest grade point average in the class. van der Merwe – a South African citizen who came to the United States in 2012 as an au pair – entered CSM’s Nursing Program in spring 2017. During the evenings’ cap and gown ceremony, van der Merwe and walked across the stage at the top of her class with the words “Not All Angels Have Wings – Some Have Stethoscopes” embossed on her graduation cap. 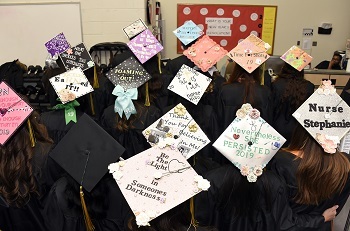 The following are the names of the Calvert CSM students who graduated with associate degrees in nursing January 17.